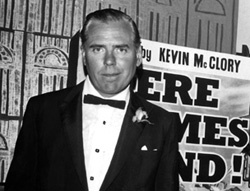 Danjaq, LLC, the producer of the James Bond films, and Metro-Goldwyn-Mayer (MGM), the long-time distributor of the Bond films, along with the estate and family of the late Kevin McClory (pictured left at the Irish premiere of Thunderball), announced today that Danjaq and MGM have acquired all of the estate’s and family’s rights and interests relating to James Bond, thus bringing to an amicable conclusion the legal and business disputes that have arisen periodically for over 50 years. 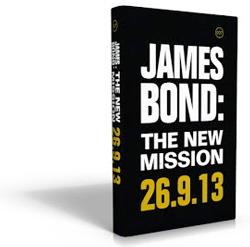 SEPTEMBER 2013 - SOLO, the new James Bond novel is launched in London! 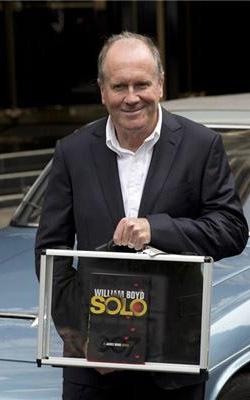 SOLO, the new James Bond novel by William Boyd is launched with a fanfare befitting a major British cultural export with a lavish breakfast at London's Dorchester Hotel. Boyd sets the opening scene of his novel at the Dorchester, where Bond is found celebrating his 45th birthday. Set in 1969, SOLO sees Ian Fleming's spy sent on a mission to halt a civil war in West Africa. 007 MAGAZINE’s Luke Williams reports from the Queen Elizabeth Hall as William Boyd is quizzed by GQ Literary Editor Olivia Cole, and the audience, about his new James Bond novel SOLO. Wing Commander Kenneth Wallis has died at the age of 97. 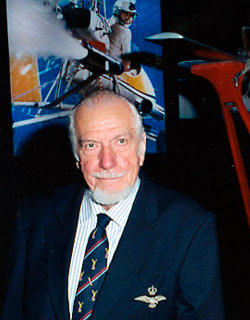 He was a wartime bomber pilot who flew 28 missions over Germany, but became better known after the war as a key figure in the development of the autogyro. Wallis was the designer of the Wallis WA-116 Agile nicknamed 'Little Nellie', and also doubled for Sean Connery as the pilot of the craft in the celebrated aerial sequence in You Only Live Twice (1967). 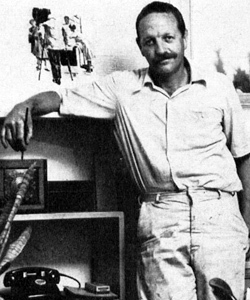 His connection with film came at the suggestion of production designer Ken Adam after he heard a radio interview with Wallis and realised what a perfect fit his creation would be for the gadget-loving 007 franchise, and a very suitable follow up to the jet pack briefly featured in the previous Bond movie Thunderball (1965). AUGUST 2013 - BOND CAR SURFACES! 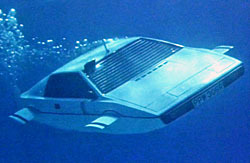 The famous submarine-car driven by Roger Moore in The Spy Who Loved Me is going on sale later this year. The vehicle to be offered by RM Auctions at its forthcoming London sale, 8-9 September, in Battersea Park, is the one and only fully functioning car especially designed and built for the famous underwater sequence seen on screen in the 1977 film. 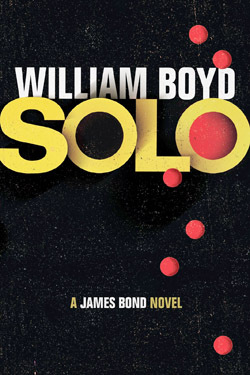 AUGUST 2013 - Cover for new James Bond novel SOLO revealed! 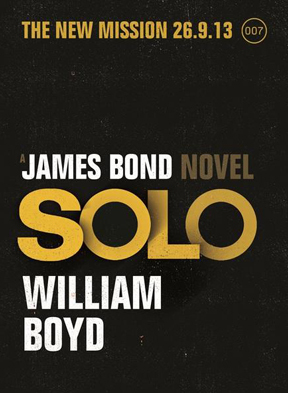 As anticipation builds for the publication of the new James Bond novel, SOLO by William Boyd, Jonathan Cape is delighted to reveal the official cover. They have also announced that British actor Dominic West will be the narrator of the audiobook edition of SOLO. The cover, which has been designed by renowned Random House Creative Director Suzanne Dean, features a stunning retro-inspired die-cut design including, amongst other things, bullet holes. Dean took her inspiration from the 1960s setting of the book and design heroes including Saul Bass, who was also the inspiration for Random House’s Vintage Classics Ian Fleming series. In true James Bond style, the primary colours and bullet holes of the dust jacket hint at danger, adventure and espionage – whilst removing the outer dust jacket playfully reveals a red hardcover printed with bullet burns and a gecko, a reference to James Bond’s African mission in the book. 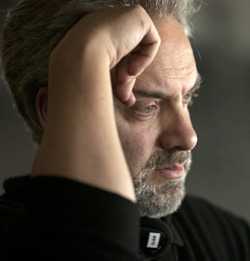 JULY 2013 - Sam Mendes returns to direct BOND 24 for 2015 release! Producers Michael G. Wilson and Barbara Broccoli, EON Productions; Gary Barber, Chairman & CEO, Metro-Goldwyn-Mayer; Michael Lynton, CEO, Sony Entertainment, Inc, and Amy Pascal, Co-Chairman of Sony Pictures Entertainment today announced that Daniel Craig will once again return as the legendary British secret agent in the 24th James Bond film and Sam Mendes will also return to direct the screenplay written by John Logan. The film is set for release in UK theatres on October 23, 2015 and in US theatres on November 6, 2015. 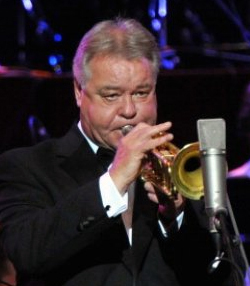 Session trumpeter Derek Watkins, who played on every official James Bond movie soundtrack from Dr. No (1962) to Skyfall (2012), has died at the age of 68. Thomas Newman, who succeeded Arnold as the composer of the score for Skyfall, also recently praised Watkins' status in Bond history: “When Sam Mendes went out on to the podium after we'd finished recording and acknowledged Derek, you should've heard the orchestra. He had to take two bows because people kept applauding him”. American artist and illustrator Mitchell Hooks renowned for his artwork for paperback books and magazines has died at the age of 89. Hooks painted the iconic image of Sean Connery as James Bond 007 used on the UK Quad poster for Dr. No in 1962. The US 1-Sheet poster followed in 1963 using the same design, but added small line drawings of scenes from the film. 1969. A veteran secret agent. A single mission. A licence to kill. James Bond returns. The title and plot may remain a closely guarded secret, but Ian Fleming Publications have announce that William Boyd’s new Bond novel will be published in the UK by Jonathan Cape on 26th September 2013, and will be available from HarperCollins in the United States and Canada from early October. 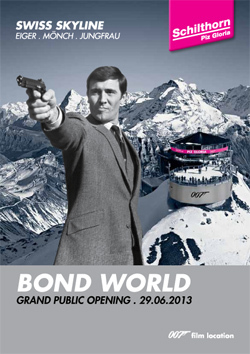 Visit www.jamesbondthenewmission.co.uk to hear all the latest news as it is released. Today, a train named after James Bond film Skyfall was unveiled at King’s Cross Station. It’s the first time a film has permanently given its name to a train. The East Coast London to Edinburgh service, train number 91007, has been renamed Skyfall with each of its eleven carriages wrapped in Skyfall artwork. Producers Barbara Broccoli and Michael G. Wilson, actress Naomie Harris (Eve Moneypenny) and writers Neal Purvis and Robert Wade were on the train’s maiden journey which departed from platform 007 at King’s Cross at 8.33am. 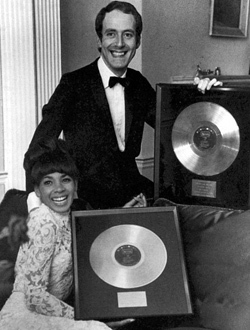 ABOVE: Shirley Bassey and eleven-time James Bond composer John Barry with gold discs awarded for the recording of 'Goldfinger' which sold over one million copies in the USA in 1964. Shirley Bassey was made Dame Commander of the Order of the British Empire in 2000. 'Goldfinger' (co-written by John Barry, Leslie Bricusse & Anthony Newley) was inducted into the Grammy Hall of Fame in 2008. Dame Shirley Bassey will make a special appearance on the Oscars®, show producers Craig Zadan and Neil Meron announced today. “We are thrilled to welcome the legendary Dame Shirley Bassey to our Oscar show,” said Craig Zadan and Neil Meron. “Her association with film music is world renowned and we are proud that she will be making her first Oscar appearance on our telecast. Oscars for outstanding film achievements of 2012 will be presented on Oscar Sunday, February 24, at the Dolby Theatre™ at Hollywood & Highland Center®, and will be hosted by Seth MacFarlane live on the ABC Television Network.